The end of “Trip To Stabby Town” saw Lucifer put his foot down when it comes his place in this world, proclaiming Earth the only place he’s ever truly felt at home. He was banished from Heaven, ran away from Hell, and finally found peace on Earth. In theory, that should be the end of the discussion, as Lucifer choosing Earth as his home doesn’t mean that his mother and brother also have to choose the same fate. Unfortunately, as “Homewrecker” proves, when it comes to Momma Morningstar and her family, everything is an “all or nothing” situation with her. And in this case, that means Lucifer is going back to Heaven with her and Amenadiel, true end of discussion. Because “Charlotte,” as much as she loves her sons, thinks that love is enough to pick up where they left off, despite all the time that has passed and things that have changed. Uriel was most likely right when he said God would take her back the moment she returned to Heaven, because that’s what she does: She gets what she wants, even in a human world. Except when it comes to Lucifer, try as she might. And she will. Outside of the celestial beings context, it’s a situation that shouldn’t be too hard for most people to wrap their heads around. During his sit-in, Lucifer brings up a point to “Charlotte” that he himself learned from his time around Chloe and other humans: “A mother doesn’t have to agree with her son in order to support him.” Just a moment later, he even chuckles out of surprise and actual joy that “Charlotte” is actually being a “good mom” in this situation by attending the sit-in. That should be the end of it, as “Charlotte” finally gets full acceptance from her son, even after the argument they had last week, and she knows that—finally—her son is happy. Instead, her acceptance is only brief, as she can’t just let it all go. Even though Lucifer has plainly stated that anything other than what she’s just done would be the opposite of being a “good mom.” Her version of happy (and even Amenadiel’s supposed version of happy) is the only one that matters, even though she’s being told and show that it’s not. It’s an unfortunate “mother knows best” situation, when all signs point to her not knowing best. So as the “villains” of the week both go to prison for each other and Dr. Linda talks about the selfless acts humans do, Lucifer again shows the fundamental misunderstanding that celestial beings like “Charlotte” and Uriel have about humanity, one that will always throw a wrench in their plans. The selfless, “greater good” that these higher powers think they’re serving is completely selfish. “Charlotte” thinks she’s being selfless—she’s doing all of this for her family, after all—by coming up with ideas for Lucifer to want to leave Earth for “home,” ideas like blowing up Lux or even Chloe. It’s all extremes for her, which continues to be her fundamental flaw, even when she thinks she has humanity all figured out. For all the discussion of and assumption about “Charlotte” having a secret plan to get what she wants, “Homewrecker” really shows how cunning yet ultimately unprepared she is when it comes to enacting said plans. And this episode’s case-of-the-week features humans who are anything but cunning but still go to actual selfless extremes, as misguided as they are. After last week’s blade-induced massacres, “Homewrecker” also sees a perpetrator (or perpetrators, given their “confessions”) who is technically an innocent, having had a moment of blind rage as the result of a much more villainous “victim.” Lucifer’s own blind rage had him raise his voice and a blade at his mother last week, but this story features death and prison sentences in response to a father’s attempt to destroy the one good thing in his son’s life (his relationship, his sense of “home” with his fiance), so… Things could have ended worse for Lucifer and “Charlotte.” Sure, the two love birds in this episode are absolute saps, which undercuts the story a bit, but they’re still an interesting counterpoint to how things are being handled with the non-humans. And Lucifer doesn’t even have an idea of just how much his mother has tried to sabotage his home on Earth by the end of the episode. To him, the worst of it passed with their argument at the end of last week’s episode. He has no idea that his mom wanted to blow up Lux, and the only reason she doesn’t is because the bomb maker is too scared. That’s not exactly the best way to maintain your son’s trust. It’s something I’ve addressed a few times during my reviews of this season, but it’s especially important in the aftermath of the reveal to Dr. Linda: The only way to truly let Chloe (or any human character) in on Lucifer’s secret is for him to show her his real face. After season one’s sometimes frustrating decisions for the sake of prolonging the inevitable, this season has come a long way in making intelligent choices when it comes to Lucifer’s not-so-secret secret and how the show plays around with the knowledge (or lack thereof) of his true self. 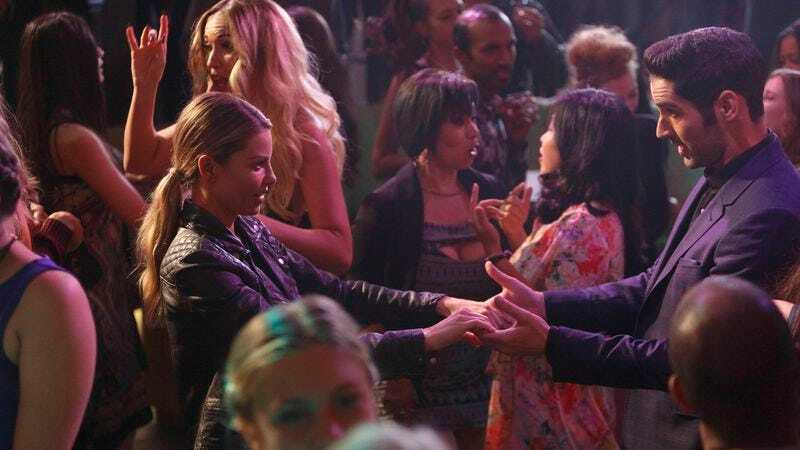 Since the season premiere, Lucifer has steadily been building towards the necessary reveal to Chloe. This is the episode that officially addresses why it’s being prolonged, and it opens up a can of worms. That’s because it hits on the Lucifer/Chloe feelings part of it all, which had been intentionally shied away from in the first few episodes of this season. Obviously, the implication is that Lucifer has feelings of love for Chloe, but are they even necessarily romantic? He clearly loves his family, dysfunction and all, but there’s not much platonic love in Lucifer’s life. His relationship with Maze could possibly fit the bill, but that won’t really be true until they can get to a healthier place. Lucifer’s positive relationships are typically separated by his familial love and flat-out lust; actual love for a human is not what he typically does. So while everyone and their therapist may be able to see how much he cares for the good detective (as she does for him, as an episode like “Homewrecker” reminds us Chloe Decker is really a great friend), Lucifer can’t. When he’s faced with that, like he is here, he has no idea how to handle that. Remember last season, when Lucifer didn’t trust Chloe and did everything he could to avoid her? He’s basically doing that again by the end of this episode, only this time, there’s far more baggage, trust, and Chloe possibly being blown up by his mother on the line. Unfortunately, “Homewrecker” doesn’t focus on Lucifer’s futile attempt to show Amenadiel the brighter side of the “city of angels.” Though, really, it’s quite amateur of Lucifer to try to hook anyone on Los Angeles with tourist traps in Hollywood. Instead, Amenadiel is put on the backburner again, though it’s clearly intentional. Lucifer wants his brother to stay with him, and “Charlotte” is quick to address Amenadiel’s obvious feelings of unimportance by saying she cares about all of her children and just wants them to be together, but this story has yet to truly touch on what Amenadiel wants. Dr. Linda is really the only one who addresses this when she brings up that his fallen angel status may have more to do with him wanting to go back to Heaven than his actual desire to go back. He obviously doesn’t feel like he belongs in Los Angeles, on Earth at all, but at the same time, his scenes with Maze happen to be the only ones in the episode where he looks completely comfortable. He doesn’t fit in as an angel anymore, and unless he’s drinking, he doesn’t feel like he fits in as a human. And the only people Amenadiel can be himself around are a demon and his brother’s therapist. What the hell is he supposed to do with that? The elephant in the room, however, is that “Charlotte” is spending all her time trying to jerk Lucifer around after he did everything he possibly could to protect her from going back to Hell. Disrespecting his wishes the way she does is the opposite of a thank you, and she’s so far gone she can’t even realize that. Again, the way Lucifer lights up at his mother attending his sit-in should be the end of it, if only she could look past her own ideas for what the future of her family should be. And while it’s fine to assume that “Charlotte” had possibly really given up until Dr. Linda unknowingly pointed her in the direction of Chloe, it unfortunately doesn’t change the fact that her decision to move on to that lone target is still a “bad mom” thing to do. Even if Tricia Helfer does look diabolically debonair with trigger-pushing murder in her eyes. So while “Charlotte” becomes more and more of a villain (and just a bad mom), Dan continues his upward trajectory as a character and a “normal” human one at that. The character work with Dan these past few weeks truly pays off here, as he’s manipulated by “Charlotte” in her Take Lucifer “Home” plan. The Dan/”Charlotte” date is actually one of the more subtly heartbreaking moments of the season so far, simply because we’re now aware just how hard the guy is trying to keep his head on straight. And now, as he opens up to someone outside the inner circle, it’s not even for real reasons, and he doesn’t even know that yet. Sure, it’s funny to watch Amenadiel freak out and Maze watch it like she’s watching her “stories,” but as Dan talks about how he’s been “a bit gun shy” about getting back into the dating pool, he ends up dipping his toe into the worst possible option. This wouldn’t have worked quite as well prior to the recent character development, but after bath houses and action movies, it’s hard not to feel for the guy. The true mark of evil is that “Charlotte” doesn’t even respect him enough not to call in a bomb hit in his bedroom. “Homewrecker” sets up a lot of pieces and questions for the future of the next episode(s) and even the rest of the season, while maintaining Lucifer’s now default setting of funny with a side of heart. Despite the more staggering implications about home and lady detectives getting blown up, this is honestly a nice breather in a pretty emotionally-crippling (in the best way) season. Maze: “That woman is dangerous, duplicitous, and she’s standing right behind me, isn’t she?” Not since Happy Endings has a show deserved the benefit of the doubt and much appreciated use of a “she’s right behind me, isn’t she?” Lucifer has earned this, as on any other show or even earlier in this show’s run, it would’ve come across as hackneyed instead of just another part of Lucifer’s weird sense of humor. Back in his Smallville days, Greg Beeman was the first television director I ever really took notice of; he continues his stellar work behind the camera in this episode, really hammering home the humorous beats. The “she’s right behind me, isn’t she?” and Eric Cooper plummeting to his doom moments are absolutely made by his direction, as is the spectacularly Melrose Place-esque villainy of “Charlotte” at the end of the episode. “Charlotte”: “Oh. She thinks she’s smart.” The patronizing pity with which Tricia Helfer delivers this particular line… In that line alone, the character’s entire disregard for Maze is shown, and it cuts like a knife. 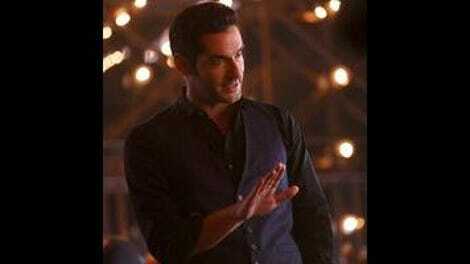 Lucifer: “Yeah.” Chloe is especially sassy in this episode. In fact, she’s especially comfortable with Lucifer here, which of course sets us up for the blow of him standing her up for dinner. Despite Amenadiel not caring for Lucifer’s attempt to make him fall in love with Los Angeles, him attending the sit-in at Lux is an understated brother moment. Amenadiel may not be a fan of Earth or Los Angeles, but his brother is, so that’s enough. 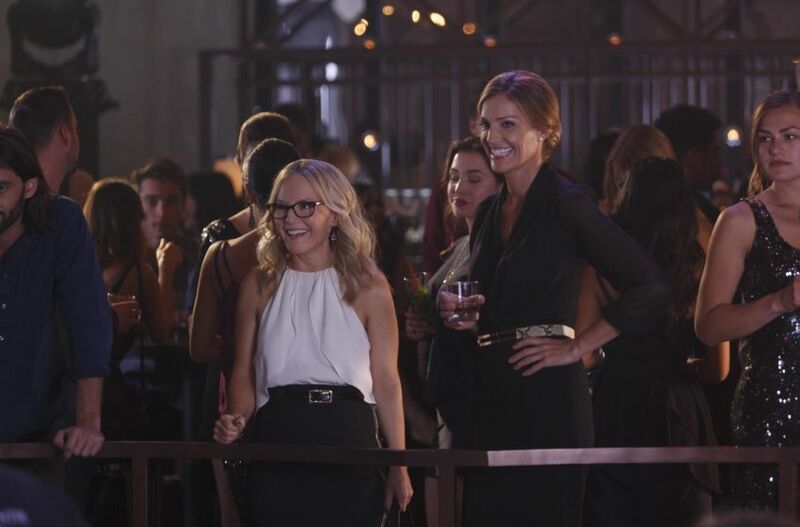 The height disparity between Rachael Harris and Tricia Helfer is phenomenal, but the best thing about Dr. Linda and “Charlotte’s” interaction is how much “Charlotte” seems to appreciate Dr. Linda’s immediate refusal to share any information about her sessions with Lucifer. This comes right off of Dr. Linda showing such reverence to “Charlotte,” and Helfer sells “Charlotte” as understanding and even kind of liking her underestimation of this particular human. Especially since, to her, her estimation of every other human has been right. I have no idea if it was intended, but Flex Alexander’s homewrecking “professional tempter” character gave me serious attempted spin-off character vibes from the moment he was introduced. Because of that, I never once believed he was the killer… So him not being the killer hasn’t changed my mind on that one. Dan slept with Lucifer and Amenadiel’s mom.